PHOTO: Will Nebraska trick-or-treaters get free Huskers tickets? 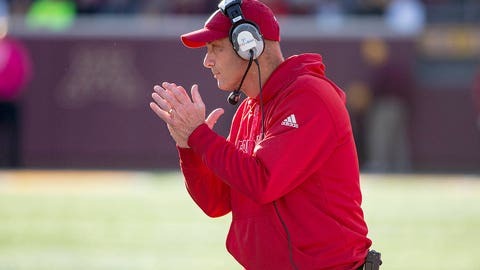 The wheels have come off for Mike Riley and for the Cornhuskers. Those screams you hear are not children being scared on Halloween, it’s thousands of Husker fans gasping in horror as they watched their team lose 55-45 to Purdue. The Huskers were already having a bad season, with their first five losses coming by a total of 13 points. When you lose that many games in gut-wrenching fashion, you are bound to have a meltdown at some point. That day was Saturday as the Huskers were blown out by the Boilermakers; a couple of late touchdowns made the game appear closer than it was. With the loss, the Huskers have lost six games before November for the first time in the school’s 125-year history. The fan may have just been joking, or had second thoughts, because the tweet appears to have been deleted. By not offering the seats, he might actually doing others a favor, judging by how the Huskers have been playing. The Boilermakers had not won a Big Ten conference game under head coach Darrell Hazell and had only beaten one Power 5 opponent during his tenure. Now the question remains: Is this truly rock bottom for Nebraska or are there more firsts in school history to come under Mike Riley?